Hope everyone had a good Christmas and New Year. While Noisy gets his new house of boxes organized, I’m back with my regular Tuesday review. 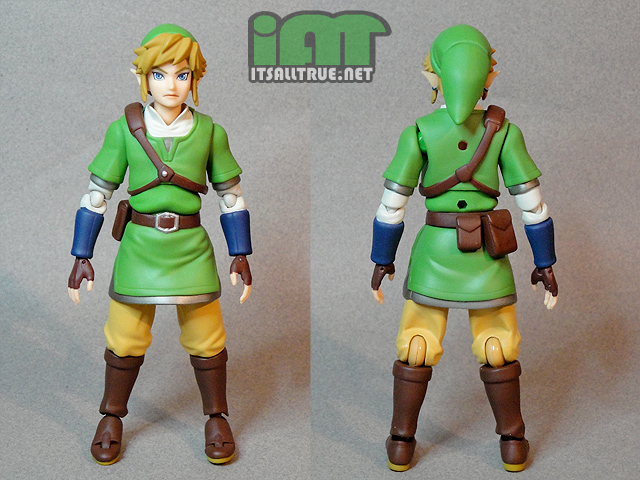 So bear with me as I get back into the swing of things with a look at Figma’s Skyward Sword Link. This is actually a hard review to write, and not just because I’m a bit out of practice. Link has had a few figures over the years, but none were quite up to par with what I expected from the Good Smile Company would do when they announced their Figma. While the figure itself is great, I feel like there were a lot of missed opportunities also. The first thing you need to know about this figure is that it’s specifically based on the Skyward Sword game. Just like how the Samus Figma was based on her last game, Other M, Nintendo’s license seems to be restricted to the most current incarnation of their properties. We see this a lot with comic book companies, and I understand the reasoning of promoting your most current projects and designs. But these characters have been around for over twenty five years and are far more iconic than their most recent incarnation. Luckily the various incarnations of Link over the years are very similar, and Skyward Sword is no exception. We get a young looking male elf with the standard green tunic and matching pointy hat. Beyond that we get a bit of variation. There’s a metal lining underneath the tunic, which is a nice touch of medieval realism, and a white shirt underneath all that. I always picture Link with white pants, but the light tan adds a nice addition to the darker browns of his boots and gloves. Link comes with two alternate faces: normal and screaming/angry. He also comes with two alternate bits of hair: normal and windblown/moving. I love the two options we get here. Both faces look great, I just wish we had at least one more. Link’s normal face is a bit blank at best and determined at most, while the other is screaming. It would have been great to get a third face that was smiling or laughing, anything that looked happy. Link was never this dour in my head. Like most Figmas, Link’s articulation is excellent. His head, shoulders, elbows, knees, and ankles are all swivel/hinge Figma joints. His wrists are also swivel/hinges, only with pin joints. His neck, chest, and hips are all ball joints. 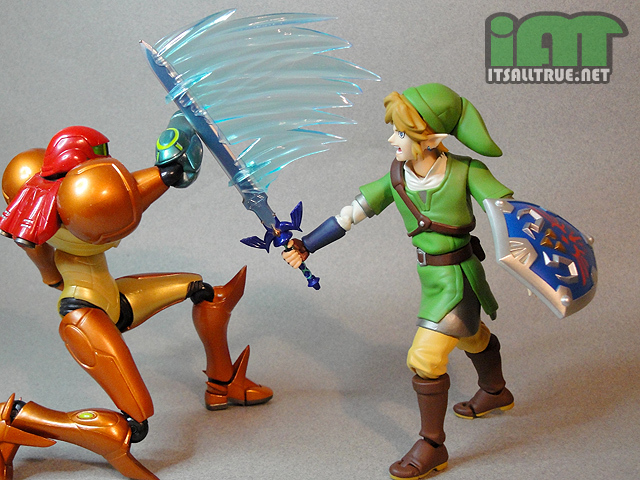 Link has a couple extra points of articulation that you won’t find on most Figmas. First are his hinged toes. Samus also has this joint, but most Figmas don’t. Link’s second unique joint is a swivel for the back of his hat, which allows you to point it in various directions. Great review and pics! Normally, I just read these reviews, think “Huh. Neat toy.” and get on with my life. But you bring up a good point . . . Super Smash Brothers. If they ever make a Bowser in this line, I’m bagging one! Just out of curiosity, how big are these figures, anyway? Link should be just under 6″. Samus is about 6″. Cool review Vault, especially like that last pic with him about to decimate some reanimated skeletons (I’m sure there’s a specific in-game name for them). Is it very difficult to get the sword in Link’s hands? I find that I have to pry the hand apart if I want to put the sword in any of the hands. I hope we eventually get a Figma Bowser (or D-Arts since they’re doing Pokémon). 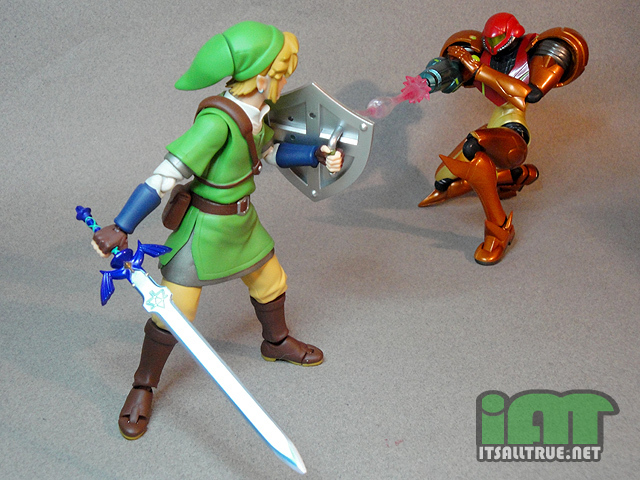 I also want a Ganondorf, though I’d like him based on his design Smash Bros. Melee. that’s the term you’re looking for. Snakes are Ropes, Bats are Keese, Skeletons are Stalfos. Thanks for the scale info, Bigbot. And now, thanks to the list of game baddies, I’ve got that rap tune fom the original Legend of Zelda game ad running through my head. No. Neither of those. I mean . . . .
And remember, you made me do this. If it consoles you any, I always picture Link with brown hair and no pants. Does he like to say: “Excuuuuuuuuuuuuuuuuuuuuuuuuuse me, Princess!” too? 80s Toon Link actually wears brown pants. 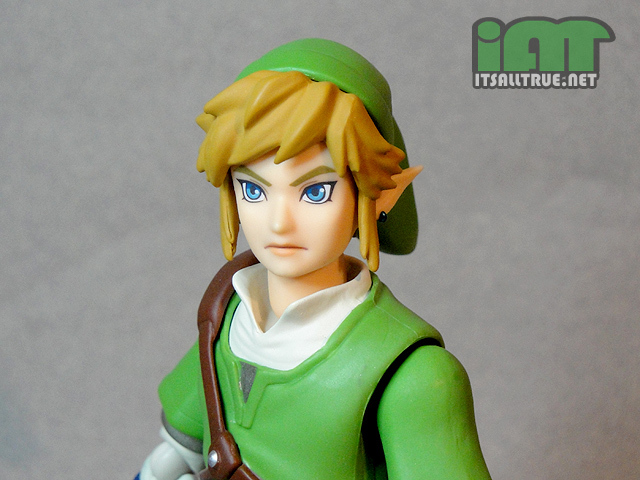 But it’s true, I’d be all over a figma of a Link that looked like this. I want to thank the idiots of Diamond Select Toys for not securing the rights for the US market, and BBTS for not even offering a discount to their buyers. An applause for both! Nice to see you guys back in the review game! Great Job! As a big fan of the Zelda games, glad I was able to snag this awesome figure. Great review! Just a note to anyone having issues with the sword being put in the figure’s hand: you pop the bottom of the hilt off and then you can slide the hilt into the hand before replacing the bottom. No prying the fingers or jamming necessary and it stays in nice and securely. As far as I can tell, the design of the sword wasn’t meant to come apart like that. Mine appears to be glued together, and I’ve read others with the same experience. While some people have pommels that do remove easily it was not designed to come off (this has been confirmed by the manufacturer). If your’s comes off consider it a “lucky” QC issue. But don’t force it, people have broken them trying to get the pommel off. Thanks for passing along the official info! Hope everyone finds out before breaking their swords!! cool. I think I still have the Toybiz one that was packed with the horse in late 90s/early 2000s? I know I still have the horse floating around somewhere…? I was a little bit heartbroken when my pre-orders for this and Samus got canceled. Apparently, there are no plans to release more.